I’ve been working and re-working a canvas 30.5cm x 40.5cm over the last few weeks. It was beginning to take shape and this morning I re-worked it some more. Someone who was self-employed once told me that they tried to make a bit of money every day. 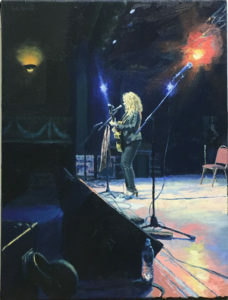 As a self-employed artist this is not possible for me for I tend to work on my paintings over many days, often weeks and sometimes months or I may be delivering works to galleries. As trying to make a “buck” every day is inappropriate for me I endeavour to improve the painting on which I am currently working each session I spend on it. I had hoped to finish this painting by the end of last week but by about 1.00pm today (Sunday) I felt I had finally resolved a couple of areas that I thought needed “tweaking”. At my Thursday morning adult art class I often warn my class members of the dangerous tinker zone! I think I avoided this potentially catastrophic period and the painting is now finished. 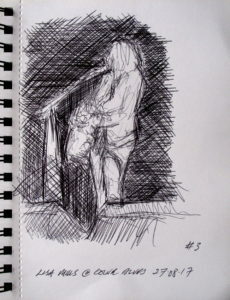 I rarely get up close to the stage, leaving this area to the official photographers, but I really wanted to sketch Lisa Mills from a little closer and I found a great view-point standing in between two speakers. I often find that my choice of composition is found intuitively. Whether at a gig or in the landscape I will feel that the image before me is “right”. I’ll more often than not change aspects of the composition as I develop the work but these are usually tweaks although sometimes radical reconstructions are deemed necessary. I want the work to seem natural and not staged-spontaneous even. Having said this I am always conscious of the painting’s structure, how different elements fit or sit together. 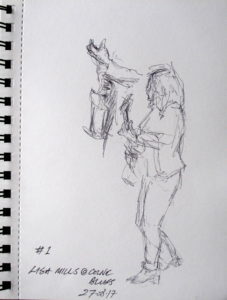 The composition is always carefully considered even if the initial response was largely intuitively felt or perceived. I like the quote from Degas, “I assure you no art was ever less spontaneous than mine. 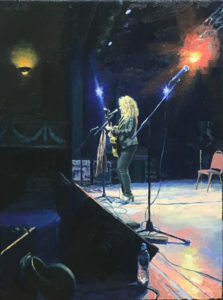 What I do is the result of reflection and study of the great masters; of inspiration, spontaneity, temperament — temperament is the word — I know nothing.” This quote is regularly paraphrased to ‘Of spontaneity I know nothing’ and these words are seldom far from my thoughts when arranging, structuring and composing a painting. At first glance the works of Degas look almost like snap-shots and certainly have a spontaneous feel but on closer study his works are beautifully arranged. 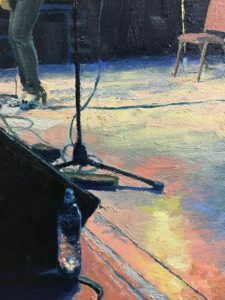 Hopper seems to achieve a similar effect-whilst initially everything could almost be a from a quickly taken photograph once one really looks at his works they reveal a carefully considered structure and placement of everything. 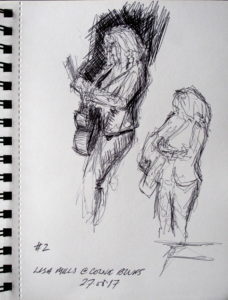 From my sketches and the numerous photographs that I took during Lisa’s performance I decided upon a composition that utilizes a series of diagonals. I love the way Degas and Hopper manage to achieve a sense of spontaneity in their works and I also love the way in which their compositions are so carefully structured. 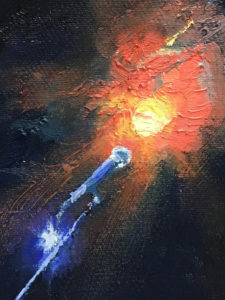 Below is a small detail of an UNFINISHED painting inspired by Lisa Mills at The Great British Rhythm and Blues Festival 2017 in Colne, Lancashire. Below is a detail of the FINISHED painting along with the whole canvas..
UPDATE 19th February 2018: Yesterday I thought it was finished…it wasn’t! But it is now (following a tiny adjustment)….